Watching the Netflix show Grace and Frankie gave many people a first glance of the work of Nancy Rosen, a Chicago based artist. Nancy is responsible for the paintings ‘created’ by Frankie, the fictional multi-layered character played by Lily Tomlin. It isn’t hard to see why the producers chose Nancy Rosen to create these works of art. She is a perfect fit with her seemingly nonchalant attitude towards her work, while simultaneously paying close attention to details. Working on a variety of surfaces, she creates her images with the application of oil bars, china markers, graphite and oil paint, using live models. With her complex backgrounds she accentuates the quiet inner beauty of her figure and draws life itself into her subject. 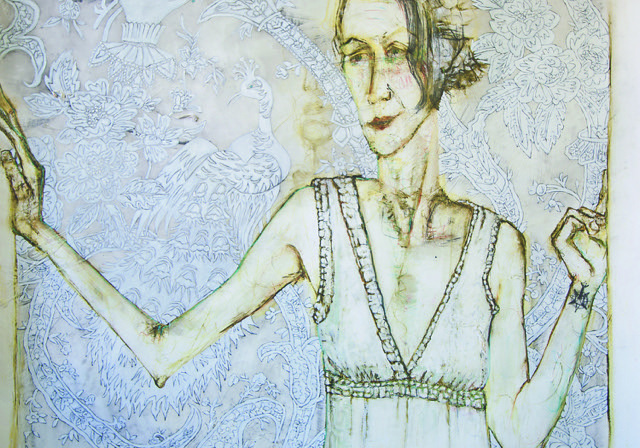 Nancy Rosen steps into the spotlight with her solo exhibit, Frankly Mine.